As we have argued repeatedly here, the Chinese Dictatorship has embarked on an irreversible path of internal repression and external menace and oppression. As if to confirm word for word what we have prosecuted on these pages, here is a magnificent piece by Angus Grigg of The Australian Financial Review, which seems to have been written with the express intent to bolster everything we have advanced here. In his book, Age of Ambition, The New Yorker journalist Evan Osnos wrote of a time when anything seemed possible in China. It was a period when fortunes were made, cities built seemingly overnight and when people expected tomorrow would be better than yesterday. Everywhere you looked there was change and it was happening in the blink of an eye. There were, of course, plenty of dark elements, but equal amounts of hope. By the time I arrived in the spring of 2012, however, the dominant narrative had moved on. Change and ambition were still prevalent, but these were increasingly over-shadowed by anxiety. In searching for a tipping point, one reference would be the second quarter of 2012. That's when growth in China's economy dipped below 8 per cent. The two-decade long "economic miracle" was over. According to official figures, China's economy still grew by more than the entire economic output of Saudi Arabia that year, but the "animal spirits" that dictate sentiment had changed. Where shortage once existed there was now excess. China's leaders called this "over-capacity" and everywhere you looked there was too much of something. By mid-2015, the mining industry had expanded so quickly that a tonne of coal was worth less than the equivalent amount of water. Steel had become cheaper than cabbage and, rather than blackouts, China wasted 18 per cent of all the wind power it generated in 2016, as thousands of turbines had been built before grid connection was available. In just a few short years, China's much-heralded model of state-planned capitalism, the so-called "Beijing Consensus", had delivered the country from shortage to saturation. Peak China had been reached and it had come more than a decade before most economists and, it seemed, state planners had predicted. The result was more mobile phones than people and an estimated 10 million vacant apartments on the outskirts of regional cities and provincial towns across the country. These were not so much "ghost towns", as monuments to the folly of easy credit and over-exuberant developers. Such excess capacity had been partially alleviated by mid-2017 through the forced shutdown of mines and outdated factories, but in seeking to reflate the economy Beijing was forced to embark on a credit stimulus larger than that undertaken during the 2008 global financial crisis. That delayed worries around a hard economic landing, but seemingly only heightened Beijing's anxiety. For, while official figures show China remains the world's fastest-growing major economy, this is not enough. Growth of 6.9 per cent in the first three quarters of 2017 may have seemed miraculous for an economy worth $US11.2 trillion ($14.65 trillion), but it didn't provide enough well-paid, white-collar jobs for China's eight million university graduates, who could expect to earn less than $900 a month. Nor did it help those graduates buy an apartment in Beijing or Shanghai, which by 2017 were considered the world's two most unaffordable cities, when incomes were compared to property prices. And, despite Premier Li Keqiang declaring a "war on pollution" in March 2013, air-quality readings across the country were often still 20 times above what the World Health Organisation considered safe. It made for an anxious ruling party and an agitated population. In response the party fell back on the old habits of authoritarianism. Rather than finding an accommodation with dissenting groups, or looking for ways to bring them into the discussion, from late 2012 the party, under the leadership of General Secretary Xi Jinping, took the opposite route. Anyone who diverted from the official narrative was a target. Bloggers, human rights lawyers, woman's rights activists, journalists and those who spoke in favour of better treatment for ethnic minorities were either jailed, detained or silenced. The gradual relaxation of free speech which had played out under former leader Hu Jintao was abruptly reversed. Social media platform Weibo (China's version of Twitter) went from a lively and often-brutal forum for outing corrupt government officials and parodying the party to a place where people posted food reviews and photos of their pets. At our lane house in Shanghai, such anxiety meant the installation of an additional CCTV camera. Under threat from a slowing economy, the party was leaving nothing to chance. No problem was seemingly too small to ignore, even the movements of two journalists from a relatively small Australian newspaper. For us this extra set of eyes became apparent in late 2014, soon after an environmental activist visited us at home. Soon after we noticed a CCTV camera had been installed on the adjacent house and trained on our front steps. While there had long been cameras at the entrance and rear of our lane, it was difficult not to view this additional installation as a less-than-subtle reminder that the operating environment had changed. And, just in case the presence of these cameras went unnoticed, a sign in Chinese at the lane's entrance read: "This area is being monitored and the tape is linked with the police station." Like in western capitals, safety was always the stated objective for installing ever more cameras, but in China there was never any pretence that one's privacy was an issue. The power of these cameras and how effectively they could be deployed was revealed to me in March 2014, when I was in Beijing to attend the National People's Congress, the annual sitting of China's parliament. Known as the "two sessions", the event is a series of choreographed meetings, where ethnic minorities in colourful costumes are paraded before the TV cameras while entering the Great Hall of the People, which sits adjacent to Tiananmen Square. But more than anything the "two sessions" is a platform to demonstrate a unified party and therefore even the slightest dissent is not tolerated. In Tiananmen Square fire fighters in orange overalls stood guard against self-immolations, armoured personnel carriers provided the security presence and plain-clothed police were stationed at intervals of 100 metres along major roads. But the real work, as I discovered, was done by the CCTV cameras. After leaving the Great Hall that March, following Premier Li Keqiang's "work report", I was waiting for a public bus back to the hotel. Preoccupied with my rapidly-approaching deadline to file my report, I was contemplating what angle to take on the Premier's speech when a protester ran into the centre of Chang'an Avenue and unfurled a banner. His one-man demonstration was over almost before it had begun. Previously unsighted security officers materialised in seconds, as did an unmarked van, into which the protester was bundled. No one spoke to me or even acknowledged my presence at the scene. But 90 minutes later, back at my hotel, the phone rang. It was the Public Security Bureau. They had "noted" my presence at the bus stop and wanted to know if I planned to report on the protester and his treatment. I was deliberately vague, even though there was little to report as the only facts were that a single protester, with an unknown grievance, had been detained by authorities near Tiananmen Square. That was not going to threaten the front page, or any page for that matter, on a day when the Premier had set the year's economic growth target, declared his "war on pollution" and vowed to transform China into a "maritime power". But as is often the case in China, the real story was not what we'd seen, rather how the authorities had reacted. In this case, the much-discussed point after deadline was how quickly I'd been identified for having witnessed this act of dissent. Playing back the scene in my head, the only way I could have been identified was by one of Beijing's CCTV cameras, which numbered about 470,000 by 2015, according to the party's official newspaper, The People's Daily. That made Beijing the most watched city in the world, closely followed by London with its estimated 420,000 cameras. The People's Daily boasted that "every corner" of Beijing was covered by the CCTV camera network and on that March morning it had performed. I initially thought my official accreditation was the way I'd been identified, but it was then pointed out that this was under my jacket and scarf on that frigid spring morning. That meant facial recognition software had most likely "made" me and from there it was just a matter of getting my number, which is registered with the Public Security Bureau, and making a call. And it all happened in just 90 minutes. More impressive was the resources they were able to throw at such a seemingly minor incident, which only served to reinforce my theory on the arrival of China's Age of Anxiety and how the foreign press corps was the focus for some of this. Reading between the lines of the regular criticism made against the foreign media in China's official press, it was clear we were either viewed as state actors, under the influence of our respective foreign governments or, worse, anti-communist ideologues determined to foment democracy and unrest in China. The idea that we were merely journalists, chasing stories and looking to generate clicks seemed implausible to our Chinese minders and it made for an inordinate amount of unwanted scrutiny. That's because in China all the media is either state-owned or controlled by the state, which is to say the Communist Party. To this end all Chinese journalists must receive a press card from the Propaganda Department and from 2014 were required to pass an additional exam that tested their understanding of Communist Party ideology. The exam was based on a 700-page manual, which defined the relationship between the party and the news media as one of the "leader and the led". Leaked commands from propaganda authorities to the state media, which are frequently catalogued on the blog site, Directives from the Ministry of Truth, tell how strictly China's news media is policed and how Xi's demand that news "must speak for the party" was actually implemented. "Delete all content related to the Panama Papers," editors at state-run news outfits were told in April 2016 after leaked documents showed secret offshore companies were held by some of China's most prominent families, including relatives of Xi. "Delete reports on calls to ease internet control," read another directive in March 2017 after a delegate at that year's People's Congress in Beijing argued internet censorship was hurting China's economic and scientific development. Such directives made easy reporting fodder for the foreign press. But at the same time they reinforced a view in Beijing and among pro-China think tanks abroad and some in the foreign business community that "the media" never wrote any of the good stories about China. We were relentlessly negative, so the argument went, focused on the minutiae, while never bothering to look over our shoulders and acknowledge how far China had come. At times this was a fair criticism. China's journey from a ruined country with GDP per capita of $US165 when Mao Zedong died in 1976, to income per head 50 times that level today is without doubt the biggest development story in history. It is often described as an "economic miracle", responsible for lifting 500 million people out of poverty and spawning a middle class of 300 million people which has been the dominant driver of the world economy for the last decade. This is the China of big numbers, which has delivered some of the most impressive figures statisticians have ever compiled. In Shanghai, like most parts of China, the numbers were on a scale that could not be replicated. The city's statisticians note Shanghai has gone from not having a single kilometre of subway line in 1993 to more than any other city in the world today. It boasts two of the world's 10 tallest buildings, an elevated road network criss-crossing the city and the world's biggest container port. This, however, is only half the story. The scale of China, with its population of 1.4 billion people, means it should be the world's biggest in most areas. But when viewed through a lens which discounts for sheer size China appears far less impressive. On a per capita income-basis, China remains the 82nd poorest country, according to the International Monetary Fund, and its economy is ranked 78 out of 190 countries by the World Bank for the ease of doing business. It has produced just one nobel laureate in the three science disciplines and has one of the highest levels of income inequality in the world. The richest 1 per cent of households own a third of the country's wealth. These are the type of statistics that are rarely aired but paint a more realistic picture of China and help explain why, despite the two decade-long "economic miracle", the party remains anxious. This anxiety is often verbalised by leaders expressing their desire to avoid the "middle-income trap" and become what the party defines as a "moderately prosperous society" by 2020. To achieve this China will need to double the size of its economy in the 10 years to 2020, but it can't do this using the easy drivers of growth it employed over the first three decades of its opening up. Put another way, the party can't continue to use borrowed money to build things as the game of catch-up economics becomes ever less effective with every additional dollar spent. As the author Yu Hua put it in his book, China in Ten Words, the country's development model was to spend $US1000 in order to generate $US100 in additional GDP. Most of that quest for additional GDP was poured into housing and infrastructure projects and was responsible for the most extraordinary statistic of all. In his book, Making the Modern World, Vaclav Smil said China had used more concrete in the three years to 2013 than the US did during the entire 20th century. And not by a small amount. According to Smil, the US used 4.5 gigatons of cement during the last century while between 2011 and 2013 China used 6.6 gigatons. That's nearly 50 per cent more and helps explain how, by the middle of 2017, China's debt levels had risen above 300 per cent of GDP, according to the Institute for International Finance. It also explains why cities like Shanghai have some of the world's best infrastructure and why Chinese tourists find the London Tube dirty, the Eurostar slow and many of the roads third world. But this impression can be misleading. While a city like Shanghai has a Maglev train which travels at 430km/h and takes a little over seven minutes to reach the main international airport 30 kilometres away, this and other projects like it have been built at the expense of social services, particularly health care. China may be the world's second-largest economy, but its per capita health spending is one-tenth of the OECD average and, according to World Bank data, it spends less in this area than the likes of South Africa and Croatia. This has been the trade-off. Gold-plated infrastructure at the expense of a better publicly-funded health care system. Such a funding mismatch never stops western business leaders lauding the quality of China's infrastructure and the benefits of a one-party state that can defy populism and take long-term planning decisions. Yet these same business leaders presumably never seek treatment at one of China's public hospitals, which have half the number of doctors per capita than the OECD average and one quarter the nurses. 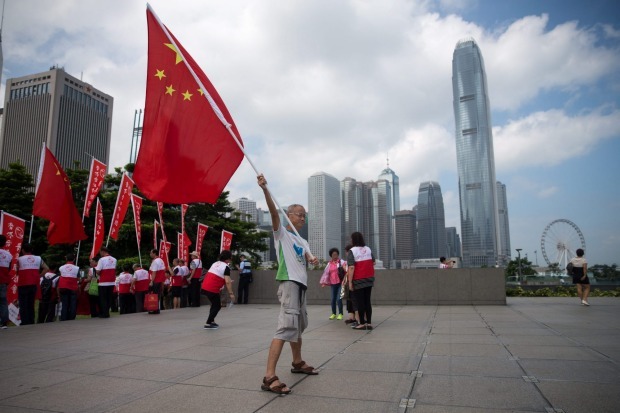 Not burdened by elections, China's leaders have in one sense chosen vanity over social welfare. As well as building subway networks in 32 cities with a further 53 under construction, and having more kilometres of high-speed rail line than anywhere else in the world, China's rulers have ploughed public funds into the construction of vast government buildings and extravagant beautification campaigns. Before his eventual downfall in 2012, the former party secretary of Chongqing, Bo Xilai, is believed to have spent $US1 billion planting Ginko trees across the city, even though the climate was too hot. In Jinan, the provincial capital of Shandong Province, the local government built what was then the world's second-largest building, behind the Pentagon. These may be isolated examples and practices which President Xi has sought to eradicate since taking office, but they are indicative of a wider phenomenon in China which has mandated growth no matter the quality. That means 41 per cent of all China's economic activity in 2017 was generated by building things, known as fixed-asset investment. The economic planners in Beijing know this number must come down below 30 per cent, but they can't be sure what will replace all that building. This is the root of the party's economic anxiety – keep building and the economy continues to grow above 6 per cent or pull back and begin a long period of slower growth as the economy restructures. The party flirted with the latter in 2014 and 2015, but ultimately did not want to see what an economy growing below 5 per cent might look like and so pushed the button on yet more stimulus. For economists like Jonathan Anderson, previously with the World Bank in Beijing and now an independent adviser, the 2016 credit stimulus, which soaked up much of the industrial over-capacity, was the final straw. He went from China optimist to fully-fledged bear as Beijing pumped credit into the system faster than during the 2008 global financial crisis. "At the current pace we would highlight 2019-2020 as crunch years when China crosses the potential crisis threshold," Anderson said in forecasting a fall in growth to between 2 per cent and 3 per cent. "This doesn't sound like much – but for an economy that has never posted a growth number below the mid-single digits, it's almost revolutionary." That is what the party and Xi fears most. He's even said as much. In 2012, soon after taking over the leadership, Xi told cadres the mistake made by the former Soviet Union was weakening the party's role in major institutions, like the army. "We must stand firm," XI said. This gives the impression of a party continually looking over its shoulder and one that will be only become more anxious in the future. Time is money. The vital formal characteristic of capitalism is the maximisation of profit. But profit is, first, a monetary expression; and second, profit is a rate in the sense that there can be no meaningful expression of profit in static terms: profit is always and everywhere a rate, in the sense that profit can only be expressed and understood as “profitability”, that is, as the rate of profit over the amount of capital invested. It follows that capital itself can never be a static, quantifiable entity - because capital can be understood only in relation to profit. Capital can never stand still: it is always and incessantly in circulation because its essence is a social reality that projects the present into the future. In the words of JM Keynes (General Theory), “money [capital] is a bridge between the present and the future”. But what does capital “bridge” exactly? Capital is a social relation. Its rate of increase, its yield or profitability is a measure of its ability to control the living activity of human beings - workers - in terms of the money wages paid to them. Capital is therefore a wager by the capitalist, the employer, that he will be able to employ workers to produce commodities that the employer will be able to sell for a money profit that will enable him to employ more workers at the same money wage. In other words, capital is the use of the monetary medium to produce commodities by means of the worker’s living activity so as to be able to purchase the living activity of more workers when these commodities are sold to the existing labour force. All production ultimately resolves itself into the cost of means of production and money wages. But means of production are themselves produced by workers. Therefore, all production is ultimately the product of the living activity of workers. Workers are forced to alienate their living activity in exchange for the dead labour embodied in the commodities they produce! It s evident that the exchange of living labour for dead labour is really no exchange at all and can only take place through violence either blatant or disguised, immediate or latent. It is the chief characteristic of capitalism to be the civilisation of forced labour whereby human living activity is turned into a quantity measured by the discipline of the factory or workplace and of the market. The discipline of the factory is enforced by the capitalist; that of the market is enforced by the consumer, which can be both a capitalist and a worker. It is evident that these two forms of discipline - one imposed on the worker, the other on the capitalist as a seller of dead labour embodied in commodities - rely entirely on an expanding reserve army of workers (relative overpopulation) to ensure that workers compete for employment, and on competition amongst capitalists for both workers and for means of production as well as for consumers. It follows from this analysis that although the immediate motivation of the capitalist is that of maximising profit, the mediate or indirect effect of the capitalist search for profit is the expansion of the working population, either actively employed or as a reserve army of the unemployed. Again, this is so because the essence of profit is politico-economic control over living labor. Thus, the search for profit transforms itself in reality in the rapid expansion of the working population, and therefore in relative overpopulation. Overpopulation is relative in the sense that it is not an absolute number. But it is overpopulation in the sense that the number of potential workers is greater than the active employment required by capitalist employers; and also, most important, in the sense that this population consumes resources in excess of what can be produced sustainably because the competition amongst the population of workers for work and money wages and ultimately for consumption goods is “competitive” because the resources available are “scarce”! Herein lies the link between capitalism and the destruction of the ecosphere. Capitalism must ensure the reproduction of the wage relation so that “free workers” are forced to alienate their living activity in a false “exchange” with the dead labour embodied in the commodities they themselves produce. But for this “free” labour force to be “forced” into alienated wage labour, the number of workers available must exceed the amount of resources, social and natural, available for a socially acceptable standard of living. That is why the population required by capitalist industry is always and everywhere “in excess” of what the environment can sustain. In other words, capitalist industry necessarily engenders the destruction of the ecosphere. The consequent scramble for social and environmental resources (minerals, land, water, and now finally even fresh air!) leads to geopolitical tensions that we now see coming to an apocalyptic crescendo. It is important to note that even the “democratic” Western bourgeoisie has always relied on the survival of brutal dictatorial and autocratic powers from Russia to China to Angola and Congo so long as they made their excess populations available for exploitation by capitalist industry. It is essential to remember in this context that “the Great Moderation” in Western capitalist industrial and financial conditions over the last 30 years coincided with the doubling of the global labour force brought about in large part by China and India and by the growth of the global population by 35 per cent in 25 years!